NASA's approach to leadership has inspired the public for decades, achieving results and overcoming obstacles that so often seemed impossible. Rod Pyle has provided leadership training to top executives at the agency and learned first-hand the situations that have guided the space agency at its most critical moments. With his latest book, he shares what he has learned and offers insight into both the inner workings of NASA and leadership lessons that span disciplines. 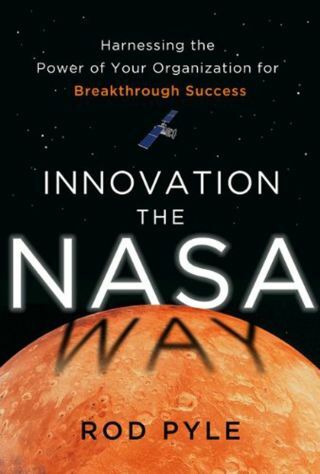 Below is an excerpt from his book, the first chapter of "Innovation the NASA Way: Harnessing the Power of Your Organization for Breakthrough Success" — problem-solving anecdotes and lessons from the Mars Curiosity mission . Find a new and innovative way to deliver the heaviest, yet most delicate Mars rover to date to the surface of the Red Planet. Build on a history of incremental innovation while taking a huge leap into untested technologies. Perform these tasks in a budgetary environment of increasingly scarce resources. Live up to the Jet Propulsion Laboratory's (JPL's) reputation for vastly outperforming stated goals and objectives. The quietude of Mars had been uninterrupted for decades. Except for the occasional furious dust storm, which could rage across Mars and vanish as quickly as it came, the planet was silent as a crypt, red dust whisking along in a forlorn breeze. A tiny sun, only a quarter as bright as that seen from Earth, hung low in the ruddy sky, and sand the color of mud stretched endlessly in all directions. The only other features that were evident were rocks . . . millions of them in all shapes and sizes, but all uniformly the color of rust. Not far from this place, known on Earth as Chryse Planitia or the Golden Plain, sat a machine, quiet and inert. Covered in a thick layer of brick-colored silt, the metallic carcass of Viking 1, one of two U.S. landers from the 1970s, had been idle for 14 years. Its radio dish was rotated toward a footpad covered in sandy drift. An errant command from Earth in 1982 had forced the lander to break contact and stare groundward permanently. For years the machine had continued to function, its small computer waiting for a command from home that never arrived. A small trickle of electric current still flowed from its fading nuclear power supply, but it was now useless, as the onboard computers had long since stopped functioning. Viking 1, and with it the rest of Mars, felt dead. Then, barely noticeable overhead, a flickering light slowly circumscribed an arc upward into the cloudless sky, then after a few minutes winked out. Eventually a red-and-white parachute could be seen drifting groundward. As it came closer, something lowered itself from the huge parachute. Then, in a move straight out of an X-Files episode, the tiny thing expanded tenfold in a heartbeat—huge tan bags looking like enormous beach balls inflated instantly as the object continued to fall. A hissing roar announced braking rockets that slowed its final approach, then, with a faint bang, the thing was cut loose from its parachute and braking rockets, falling . . . It struck Mars and bounced again and again — JPL stopped counting after fifteen. Estimates went as high as thirty. The first bounces sent it almost 50 feet skyward, only to come back to the ground for another rebound. Eventually it rolled to a stop. It sat for quite a while, and then the air in the brown bags was released with a hissing rush as they deflated. What remained looked like a little pyramid. Then, ever so slowly, one side panel lowered itself toward the ground. A full Martian day and a frigid night passed as the machine performed silent internal checks. Then, when the ruddy dawn came, a thin whirring noise and a few solenoid clicks heralded the activation of a microwave oven–sized box atop the platform. Restraining straps were cut, and in an agonizingly slow crawl, the first mobile machine on Mars used its six spiked aluminum wheels to crawl down one of the dropped sides of the pyramid. It paused near the bottom of the ramp, then gingerly rolled one wheel onto the red soil. Pathfinder's rover, Sojourner, had touched Mars. Back on Earth, cheers rang out at the Jet Propulsion Laboratory (JPL) in Pasadena, California. After years of intense and grueling effort, they had done it. It was July 4, 1997, just over two decades since Viking 1 had landed on Mars on July 20, 1976. For more than 20 years, no American machine had landed on another world. . . until now. Rob Manning, Pathfinder's young chief engineer, was elated, ecstatic, and exhausted. And his day was just beginning. Manning reflected on how, just a few years earlier, a grumpy chief designer of NASA's Apollo moonship had called the design for Pathfinder's landing system "just plain crazy." It had engendered everything from quiet titters to outright skepticism when it was first presented. Even the normally jocular Manning had squinted and gone silent for a moment when he first saw it. Delicate robotic probes don't bounce to a landing on a distant planet, and they don't then roll to a random stopping point and hope to right themselves. It was crazy, risky, and, to some people, undignified. But Manning and his team soon realized that it was a reliable, energy-efficient, and affordable way to deliver a machine to Mars—a world that disabled or destroyed 65 percent of the machines that dared to venture there. How to land a probe on Mars that arrives at extreme speeds and must decelerate immediately. Pathfinder had been an amazing challenge. The Viking program could not be repeated, probably ever, because of its great expense (about eight billion in today's dollars). This was the "new NASA" under its revolutionary new administrator, Daniel Goldin. "Faster, better, cheaper" was his mantra. Do more with less, and make damned sure it works. Unfortunately, as almost any engineer from the "faster, better, cheaper" era will tell you, the answer should have been, "Sure; pick any two." Innovation can be encouraged, but not at gunpoint. This policy engendered a series of failures, the repercussions of which were felt for years. But to JPL's everlasting credit, Pathfinder was not one of them. It was one of NASA's new "Discovery Program" missions intended to be quick and cheap. The team of young engineers designing the spacecraft was operating in the shadow of a much larger mission, the Cassini Saturn probe . That school bus–sized, multibillion-dollar undertaking provided a surprising amount of tactical and political cover, allowing Manning and his team to create a small but ingeniously efficient lander and rover pair that would begin to attract real attention only near the end of its journey to the launchpad. They had been inventing and designing and building and coding so fast that they didn't even have time to properly document most of what they had accomplished. There was no time or money for documentation. Fortunately, the machine worked. Use the simplest and surest methodology to land. Accept constructive input, and resist habitual negativity. The little rover was designed to last for 14 days, and its base station for 30. Instead, both objects lasted almost three months, though not without issues. The lander suffered a form of electronic epilepsy: a series of computer panics, when its tiny electronic brain would lock up and reboot spontaneously. It was aggravating as hell, but the engineers kept nursing it back to health. Sojourner had its own issues — the little rover tended to drift to the right as it drove around for weeks, sniffing rocks with sensitive devices and exploring a radius of about 30 feet from the lander. But it got where it needed to go — not very far, but for the first of its kind, far enough. Then, on September 27, just under three months after its arrival, the lander died, taking the rover with it. But the 14-week mission had proven that a mobile probe could be flown to and operated on Mars. In 2004, the twin Mars Exploration Rovers (MERs), each 15 times more massive than Sojourner, left Earth headed for the Red Planet. These too bounced to a landing in a fashion identical to Pathfinder and conducted an outrageously successful mission — six years for Spirit and more than ten (to date) for Opportunity. By any measure, the MERs were off the charts. But that was not on Manning's mind now — his team had designed and flown Pathfinder and been principal players for MER, but even before the MERs landed on the Red Planet, he had a bigger problem . . . both literally and figuratively. For the next rover, he had to devise a way to land a machine the size of a small car on Mars by 2010 (the date later slipped to 2012), and the bouncy arrival was just not going to work. The team would have to start from scratch to land the one-ton rover, and it made his head hurt. Rob Manning is a bear of a man, bearded, broad-chested, and ebullient. He is very passionate about his work and about Mars, and he often thinks faster than he can get the words out. He seems much younger than his mid-fifties, the gray frosting of his beard notwithstanding. Anyone who is not his friend soon wants to be. He is an inspirational leader with a keen mind and an engineer's tenacity for problem solving. And he now had the problem of a career to solve: How do you land something the size and weight of a small Toyota on Mars? As the chief engineer of Curiosity and a key member of the entry, descent, and landing (EDL) team, he knew that the success or failure of Curiosity's arrival on Mars would rest on a handful of shoulders. He felt the pressure keenly. The Mars Science Laboratory, known more popularly as Curiosity (after the rover's name), was launched on November 26, 2011, but the mission design had been underway since before 2000. The machine was huge and vastly more complex than previous rovers. It would use a nuclear power source instead of solar panels to support an amazing array of cutting-edge sensing and analysis equipment. Its robotic arm was also far more sophisticated than those of its forebears, with vastly improved versions of the scientific instruments that had gone before, some new cameras, and, perhaps most remarkably, a drill and soil scoop. This was going to be one for the record books. But all this came with a staggering weight penalty, and not since Viking had something so heavy and massive been sent off to Mars. At more than 2,000 pounds (the MER rovers had weighed 385 pounds), it was simply huge. Add to that the increased complexity and delicacy of the machine, and a beach-ball landing simply would not work. Additionally, the scientists wanted a pinpoint landing. Getting this beast to a target on Mars in one piece was a world-class problem. To land on Mars with nearly 10 times the accuracy of any previous mission. An additional issue was accuracy. The landing zones for Mars-bound landers were always mapped as an ellipse-shaped area of acceptable destinations. Pathfinder's landing ellipse had been a generous 124 miles long—if the machine bounced and rolled to a stop somewhere in that 124- by 50-mile area, the landing would be considered "on target." For the Mars Exploration Rovers, the ellipse had shrunk to 93 miles by 12 — still a large area and bigger than many U.S. counties. For Curiosity, which would be landing within a crater with high walls and a mountain in the center, the ellipse was a miserly 12 miles by 4 . . . small, considering that the lander had to arrive there after crossing some 150 million miles of space and entering the atmosphere at 13,000 miles per hour. It was like threading a needle with rope. When Manning and his team began to consider new ways to deliver Curiosity to Mars in one piece, they rapidly discovered that the brain trust that had designed the Viking landers was largely gone. So were the very expensive rocket engines that had slowed those machines to a soft landing. Armed with little more than a handful of incomplete plans, they contacted Aerojet, the company that had built Viking's landing rockets, and gave it the task of building a new throttlable rocket engine that was powerful enough to land Curiosity in one piece. But there was far more to the problem than that. The mission had a set of landing constraints that Viking's designers had barely touched upon. For one thing, nobody wanted rocket exhaust to contaminate the landing area or blow red dust and gravel up onto the rover's sensitive instrumentation. There were also engineering considerations — Viking's engines had been mounted on the sides of the lander, and once it arrived, the spent rockets merely sat there, empty and useless, as the unmoving probe worked from one spot. But Curiosity was a rover and had to be able to drive for a dozen or more miles around the landing zone, ultimately arriving at the base of a peak in the crater's center, about seven miles distant. Dragging a bunch of heavy, unneeded descent engines along was a nonstarter. And then there were what the engineers call "flight dynamics" — that is, keeping the thing upright in the air — to worry about. Viking had had three large landing legs to set down on Mars, and much of its weight had been at the bottom of the spacecraft, below the level of the engines. The other rovers had arrived on a landing stage with a weight distribution similar to Viking's. Curiosity's center of gravity was much higher, with a heavy nuclear fuel source high atop the rear of the rover and the equally heavy instrumented robotic arm and camera mast extending from the front of the machine. The center of gravity, the point around which the lander could pivot disastrously during landing, was high — dangerously high. Descending with engines mounted on the obvious spot — the sides or bottom of the rover — would be like balancing a bowling ball on a broomstick. If it toppled to one side, scratch one $2.5 billion rover. One final issue burned in everyone's minds: unlike with Viking and MER, each of which had landed twin spacecraft on Mars, there was only enough money for one Curiosity. There would be no second chance — if the single rover failed to land safely, that would be that. It would crash, the mission would be over, and, given the state of the U.S. space program in the twenty-first century, the entire Mars exploration effort would probably die with it. It felt as if all the conditions surrounding the mission were conspiring against its success. Manning sometimes felt like the British soldiers he had seen in the movies of his youth, back-to-back in a circle and surrounded by hostiles. It was not an enviable position, and only truly innovative, out-of-the-box thinking would allow Curiosity's escape. The sequence they needed to design was encapsulated in one benign-sounding acronym: EDL, for entry, descent, and landing. But the blandness of the term belied its complexity: there were no second chances, no do-overs. Seven minutes of terror. Use lessons learned from older missions combined with daring new ideas to design a system that would lower the machine, delicately and on target. Accept a calculated risk to innovate for accuracy. Many ideas were considered, and most of them were soon rejected. They either did not meet mission requirements, were way too expensive, or were just too risky. Other designs lived longer lives in the marathon technical meetings but were ultimately deemed unworkable or insufficiently reliable. Then one notion — crazy, scary, and improbable — took root. It would come to be known as sky crane. Actually, sky crane looked fairly sane until you got to the last act. Curiosity would enter the Martian atmosphere screaming along at 19,000 feet per second, and thin as the Martian atmosphere, slamming into even tenuous air at that speed was a big deal. So the spacecraft would have a heat shield even larger than that used in the Apollo program of the 1960s. This shield was shaped in such a way as to allow Curiosity to "surf" along the upper atmosphere, gliding to reduce speed. Then, after its fiery trip through the atmosphere, Curiosity would deploy a 50-foot-wide parachute designed to withstand the stresses of supersonic forces — the spacecraft would still be traveling at 900 miles per hour when it unfurled. That would require a lot of testing, but it could probably be achieved. About 15 seconds later, the heat shield would pop free, and Curiosity would be ready for the really hard part: touchdown. Well over nine-tenths of the speed had been scrubbed off by now, but those last few miles were critical to success. This is where it got really tricky. Straddling the rover itself would be a rocket pack — it looked like a huge backpack with eight of those new Aerojet rocket engines sticking out the sides. They would fire, reducing Curiosity's mad velocity to a survivable rate. The rockets would slow the rover to nearly a hover almost exactly 66 feet above Mars. But the wildest bit was yet to come. Once at a relative standstill, Curiosity would fire small pyrotechnic devices — retainers made from explosives — to separate from the rocket pack. Finally, and this is where the real weirdness began, the rover would be lowered from the hovering rocket pack by four tethers. The rover's suspension system would then drop and lock the wheels in place; they would serve double duty as landing gear. When the wheels sensed surface contact, the rover would pop the lines loose, and the rocket pack would fly away like a startled crow to crash some miles distant, its job done. Convince upper management—and your peers—that a complex, difficult-to-explain system would work. Huh? Each engineer, flight specialist, scientist, and, most important, NASA bureaucrat who saw this had his or her own individual reaction. Many blanched; some chuckled; others sucked wind and held it. This was a wild design, with a few hundred things that could go wrong (the landing sequence alone used 79 pyrotechnic devices — the little explosives — just to get to the surface). All it would take was for one of those things to fail and bye-bye, Curiosity. Let's see: one of the little maneuvering rockets could clog, fail to ignite, or explode (it happens) . . . or an explosive bolt could fail to fire (any of the above) . . . or the parachute could tangle or even tear (it had done just that during the endless testing, sometimes ripping almost in two). That would mean a bad afternoon on Mars. Manning's team convinced management that those risks were acceptable. But there were more. The rockets could fail to throttle properly, and varying their thrust was critical to success. Or the wheels might get hung up and not unfold and lock properly. The tethers that were to lower the rover might get snarled or unspool unevenly. The rocket pack might continue to descend, ever so slightly, during the sky crane maneuver, smashing into the top of Curiosity. The computer or sensing devices could get confused and send an erroneous command, allowing the heavy rover to crash. But somehow, the worst scenario seemed to be in that very last stage of the operation. If just one of the tethers between the rover and the rocket pack failed to separate,Curiosity could be yanked over onto its side and ingloriously dragged a few hundred yards before the rockets ran out of fuel and crashed miles away, still leashed to the now-crippled rover. This seemed the most undignified and tragic of all scenarios. At least if the parachute failed, the spacecraft would impact, creating a nice crater and total destruction. But to be dragged by a single string . . .
Ruminating over possible disaster is useful only if it helps to reduce risk. After a certain point, once everything had been tested and tested again, one had to say, "Enough is enough," and trust the design. Or, as Manning put it shortly before the 2012 landing when asked if he was worried about it, "I can't think of anything that should go wrong." Think boldly, be daring, exhibit confidence, and, above all, test everything. Ducking the potential for failure can lead to disaster. There were many moments of truth during testing. This was key, just as it had been for Pathfinder and the MER rovers. Test, test, test. When it broke, test it again; if it didn't break, figure out why, and then validate that with . . . another test. They tested the parachute, which ripped itself to shreds for quite some time until they got it right. They tested the rocket pack, but even success was only moderately convincing, since they were operating on Earth, a very different environment from Mars. They tested the deployment system for the rover, the heat shield, and the wheels and suspension it would land on. But the one thing they could not test was the sky crane itself — Mars has about one-third of Earth's gravity and just a fraction of its atmospheric density. There was just no way to properly simulate sky crane's lowering-via-tethers operation on Earth. They did lower the thing from a helicopter a few times, but it was not the same as what it would go through on Mars. It would simply have to do. On August 5, 2012, it was game time. After months of cruising the dark void of interplanetary space, Curiosity hurtled into the Martian atmosphere. The "seven minutes of terror" had begun. On the ground, tense controllers could only watch passively as the events scrolled down their screens. Because of the distance between Mars and Earth, some 70 million miles away, the radio messages from Curiosity were delayed by about 15 minutes. Whatever the controllers saw and heard had already happened "up there." The probe was either already down safely or shrapnel scattered across a few miles of Mars. Despite this, at JPL, the landing had a very real-time feel to it. You just couldn't help but get caught up in it, and Manning was. But his work, and that of his able team, was done for the moment; the design would either succeed or fail. So he spent a few hours before landing on JPL's TV channel (part of NASA TV) being interviewed about the mission ("It's just a fantastic spacecraft . . . really great, and I had a wonderful team ... I can't think of anything that should go wrong."). He waited out the landing with everyone else. Telemetry indicated that Curiosity was plummeting into the Martian atmosphere. It began to glide in the proper direction, aided by radar and small maneuvering thrusters. The parachute deployed and held, and the heat shield dropped away as planned. Finally, the rocket motors began to fire, slowing the lander's velocity to the critical 1.7 miles per hour. As Curiosity neared the surface of Mars, the rockets throttled to the proper thrust to slow almost to a hover. A deathly silence enfolded the room as controllers gripped their desktops, chair arms, or whatever was handy, knuckles white and bloodless. And then, in tones almost comically calm, the announcement came: "Sky crane deploying." The rocket pack was hovering, the tethers unspooling. Curiosity had made it — it was on the sands of Mars. The rocket pack separated and flew away to crash-land a few hundred yards distant, and the rover sat, alone and quiet, smack-dab in the middle of the landing ellipse . . . right where they wanted it. Checkouts began and preparation to raise the camera mast commenced, but the terror was over. The damn thing had worked. About an hour later, during a press conference in the JPL auditorium, a din could be heard from outside. The public relations officer looked up from her notes, bemused and curious. Heads turned en masse, as hardened journalists wondered if they were missing a story outside the room. And then it could be heard: the 100-plus members of the entry, descent, and landing team, all exhausted but elated, had left the control center and were dancing across the wide JPL quad, chanting and fist-pumping in wild exaltation at the top of their lungs: "E-D-L! E-D-L!! E-D-L!!" Boldness. Daring. Passion. The team of designers, scientists, and engineers at JPL and the other NASA centers who designed this mission wore these qualities like a medal, standing tall with pride. After all, the worst thing that could have happened would have been failure . . . and the only thing worse than that would have been to not try. 1. First, small steps: learn to fly landers and rovers to Mars without entering Martian orbit; use the shortcut of direct trajectory from Earth to the surface of Mars. 2. Deliver a small prototype rover to Mars via a new and untried system: bouncing to a stop on a dozen airbags. Operate fast and lean, and stay below top management's radar when and reasonable. 3. Follow this with two larger rovers using similar but vastly enhanced technologies. 4. Finally, use the lessons learned with these programs to design the largest, most sophisticated rover ever flown. 5. Because of this increased mass, draw from 30-year-old experiences with Viking landers to design a new and innovative landing system to deliver this machine to Mars with technologies that could not be tested on Earth.